Since the early 1950’s, Rolex has utilized a rotating bezel in its sport and tool watches starting with the Turn-O-Graph, a Rolex DateJust with the bezel that rotated in both directions to assist with watch timing under 60 minutes. The Rolex bezel, seen on all watches within the line, was initially designed to keep the crystal water tight and firmly affixed to the case, but Rolex added more functionality by incorporating a rotating mechanism. The appealing aspect of the Turn-O-Graph is that it is a mix of a traditional Rolex DateJust dress watch combined with the utility of a sport watch. Rolex revisits this concept with the release of the Sky-Dweller, discussed in Part II of this article. The first GMT, and Submariner bezel design were influenced by the Turn-O-Graph bezel released a few years earlier. Now, the bezel on a Rolex watch pretty much determines the watch’s utility, and its place in Rolex’s Professional line of watches. The appeal of a multifunction bezel to watch lovers 60 years ago is still prevalent today. The design and intent Turn-O-Graph, Submariners, Deep Sea’s, GMT’s, Yachtmasters and the Explorer is determined by the bezel. The Turn-O-Graph bezel of today is functionally the same as it was when it was first released. The Turn-O-Graph bezel, made of white gold as it was in the early 1960’s model, rotates in both directions and the triangle is used to mark the starting or ending point of timing something under 60 minutes (eg. parking meters, cooking time, etc) and a great tool for executives living in the metropolitan world. With the exception of the all gold models, the Submariner bezel is made of stainless steel, with a pressed in black aluminum disk, or a ceramic Cerachrom disk on the newer models. 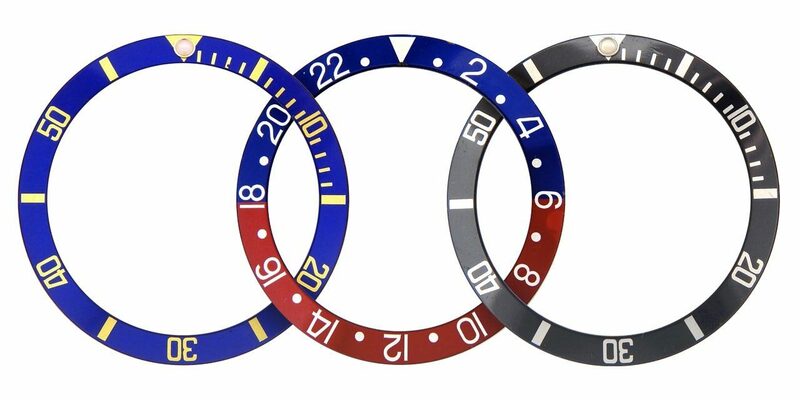 The Submariner bezel is designed to rotate in only one direction, and is used to mark the amount of time oxygen is used, or to time when a scuba diver has to remain stationary at one depth when ascending to the surface to prevent the bends. The bezel is designed to rotate in only one direction such that if knocked, the bezel only rotates to the safest part of the timing task. The Submariner bezel is the only Rolex bezel with a raised luminescent pearl at 12:00 O’clock such that the diver can both see and feel where the marker is in low light conditions. In Part II and Part III we will examine other Rolex sport and tool watches such as the GMT, Daytona, YachtMaster, and the SkyDweller.